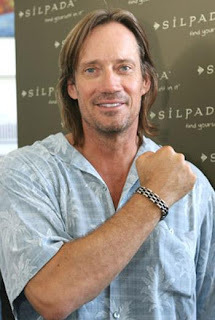 I got off my flight last Friday at Burbank and was walking towards Baggage Claim, when this, tall, unassuming Kevin Sorbo walks by. I am not one easily impressed, but even after all these years on TV, this man truly has that star presence. He looked absolutely gorgeous and it took all my might not to drop all my bags to run and grab on to his leg! Yummo! Hi, Jenny, we older women have known that for years. Yes, he can still turn heads even at 50! You are lucky to be able to see him, I live on the east coast and he's not around to star-gaze at.